The greatest singers recitalist and concert singers of the second half of the 20th century had personal contact with him and sang his beautiful arrangements of early songs, taken from folk traditions of all parts of the world. Names such as Kirsten Flagstadt, Teresa Berganza, Gerard Souzay, Irma Kolassi and Federica Von Stade are among this group, some making a pilgrimage to his home in Italy, to interact with this fascinating and multifaceted artist. With this age of vocal specialization, as well as early music performance specialty groups and performance practices, songs found in Canzone Scordate are now more and more only performed by singers and instrumentalists that specialize in this music…it is a sad state, as these songs, with their lovely melodies and sensitive arrangements, are a boon for any singer/piano duo that want to include them in song recital programs. The songs in the collection include Italian early and late baroque, early German, French and Scandinavian songs. Twenty two volumes in total, there are many other songs that did not make the collection and are at the Norwegian Institute of Sound, from North and Latin America. Arne was a song archaeologist of sorts…a song, that we sing to ourselves, for others or at family gatherings. Or a song, which many composers now a days could never hope to gain any remuneration for…there is no reason to write one at all, except if its out of love…this musical genre, perhaps the most personal one of all, is the object of Arne’s collection. The only way not to forget a song, is of course to sing it…and to have someone listen and receive it. 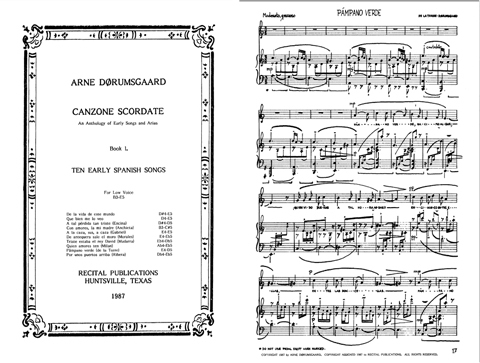 Among the many youtube clips, the one by Zehava Gal is one of the performances I admire most, she sings “Pampano verde” by Spanish Renaissance composer Francisco de la Torre, arranged by A. Dørumsgaard from volume I of Canzone Scordate. The Norwegian Institute of Recorded Sound is based on the personal collection of Arne Dørumsgaard’s lifelong collection of recorded sound, amassing one of the largest private collections in the world. The Institute is open to the public, scholars and artists that wish to visit and study the archive. For anyone wanting to explore these songs, they can be bought via my favorite place to acquire music, Classical Vocal Reprints. The collection is edited by Recital Publications in Huntsville Texas, they were first published in 1987, although these songs were made available to some of the above mentioned singers in the 50’s, 60’s and 70’s. The edition is in the beautiful and evocative script from composer’s pen. Before I put my nose to the grindstone with Canzone Scordate, I’m working now on a new disc and investigation that explores the relationship between Rossini and Spain, more on that in my next couple of blog entries!